Linear alpha olefins are petrochemicals which are unbranched alkenes with the chemical formula, CxH2x. They are produced majorly by dehydration of alcohols, oligomerization of ethylene or the Fischer-Tropsch synthesis followed by purification. Linear alpha olefins comprise of various important products like 1-butene, 1-octene, 1-hexene, 1-tetradecene, etc. They have terminal double bond at the primary carbon of the chain which increases their reactivity. Being a versatile organic compound, they are used in a number of industries such as cosmetics and pharmaceuticals, chemical, coatings & paper, automotive and consumer goods. Linear alpha olefins are used in the manufacture of polymers like polyethylene and polyalphaolefin, synthetic lubricants, detergents alcohols, plasticizer alcohol, etc. 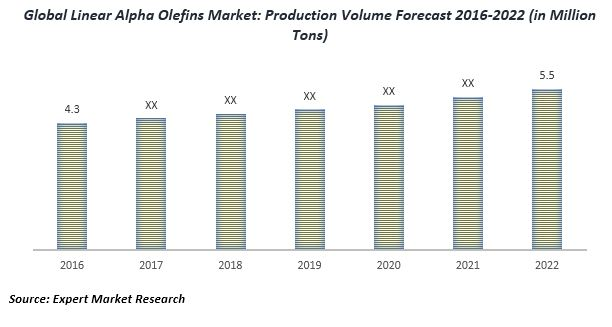 According to a new report by Expert Market Research, the global linear alpha olefins market reached a volume of 4.7 Million Tons in 2018 and is further expected to reach 5.9 Million Tons by 2024. The production of linear alpha olefins witnessed fluctuations during 2014-2018 as a result of a significant fall in the year 2009. The market, however, recovered in the year 2010 on account of numerous forces. The majority of the total global consumption of linear alpha olefins is in the polyethylene industry as co-monomers in the production of linear low-density polyethylene (LLDPE) and high-density polyethylene (HDPE). Thus, fast-growing polyethylene industry has significantly increased the global demand for linear alpha olefins in the past several years. Moreover, changing consumer preferences, rising disposable incomes, increasing focus on bio-based alpha olefins along with a strong demand from emerging markets are other factors that have facilitated the market growth. The major end-uses of linear alpha olefins include LLDPE, detergents, HPDE, lubricants, LPDE, plasticizers, fine chem and oil field chemical. In 2018, LLDPE represented the largest end-use segment with the majority of the market share. Region-wise, North America dominated the market with a share of more than a fifth of the total global production in 2018. It was followed by Western Europe, Central and Eastern Europe, South Africa, Middle East, Japan and other Asia. Being concentrated in nature, the global linear alpha olefins market is surrounded by a small number of players which include Shell Chemical Ltd., Chevron Phillips Chemical LP, INEOS Oligomers and Sasol. The betaines market in North America is expected to reach a volume of around 200 KMT by 2024 and the global betaines market is projected to expand at a CAGR of about 4% during 2018-2024.